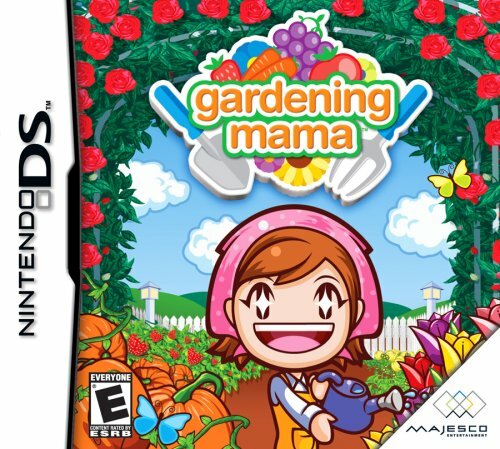 Just as millions of players enjoyed slicing and dicing with Mama in the kitchen, they can now move to the great outdoors -- planting, pruning, picking, and creating -- in Gardening Mama! Gardening Mama transforms the DS stylus into a universal gardening tool that players will use to plant, nurture and harvest flowers, fruits and vegetables. Gamers can manage their garden through the seeding, blooming and maturation phases, and then produce items from the plants they've grown (i.e. grow strawberries to make jam or raise pumpkins and then carve a jack-'o-lantern). A robust multiplayer mode lets up to four friends compete to grow the biggest harvest and Treasure Box mode lets players share items they've grown with online friends. Gamers can also decorate various gardens while creating goods like pergolas and hanging baskets. In addition, players can change Mama's outfit to their liking while customizing the screen design to their preference.